With so many options to brag, share, and find support, navigating the ever-shifting landscape of social media safely, responsibly, and productively takes some reflection and planning. Before baby, you were a Facebooking, Instagramming, texting fool, sharing everything from your perfect pasta dish to your hella-good manicure. Now, looking at your little bundle of joy, you may be wondering: Is it safe to post pictures of my baby? What’s OK to share and what’s TMI? What are the easiest tech tools to preserve those precious moments, without broadcasting to the world? These tips can help. Safely share photos of baby online. You may never have given privacy settings a thought. But if you’re posting pics of baby, you may want to think through the impact and potential trajectory of what you post. Maybe you have followers struggling with infertility who aren’t ready to share your joy. Maybe you’re connected to people you barely know — friends of friends of friends — and there’s no guarantee that those people will have your family’s best interests at heart. Stories about people’s kids’ photos falling into the wrong hands — for example, stock-photography brokers looking for baby pics to sell or internet trolls misusing images — are a growing risk. You basically have two options to share safely. You can enable stricter privacy settings on the social media services you’re already using, such as Facebook, Instagram, and Snapchat (including investigating whether Facebook’s Scrapbook is right for your family). These services have the advantage of an existing, built-in audience, but there’s a greater possibility of photos being viewed (or copied, or downloaded) by people you don’t know. Or, you can sign up for a more secure, password-protected photo-sharing service such as Flickr, Photobucket, or Famipix. These let you be pickier about what you share with whom. But these sites sometimes charge a fee for premium services such as extra storage and prints. Distinguish between friendly advice and real facts. As a new parent, you may be vulnerable, worried, or overwhelmed, and social media offers a lifeline. Just don’t believe anything people tell you without verifying it with a professional. (No, WebMD doesn’t count.) Anything that has major importance — feeding, health and safety, money, education — is not to be toyed with. Anything with minimal consequences, such as when to put baby in shoes or the best time to clip her nails (when she’s asleep), is OK to experiment with. What’s over-sharenting? Pictures of poop, constant updates on every smile, gurgle, and hallmark of intelligence, reports on what a naturally gifted mom you are. Other parents understand the urge to brag about every little thing, but social media is a give and take. Be thoughtful about what you’re sharing, why, and with whom. And make sure to comment, like, or otherwise interact with what friends and family post to keep it, you know, social. Approach baby’s “digital footprint” mindfully. You might love the photos of baby in the tub, but how will she feel about them when she’s 8 or 9? Tweens or teens might be upset that you used their names to create profiles they didn’t actually consent to. Social media sites are for users over 13 because companies use data — basically, who your friends are, what you click on, and where you go on the Web — to build a demographic profile, which they then sell to other companies for marketing purposes. The data isn’t personally identifiable, but it’s still Big Brotherish to think they’re tracking your baby’s online movements. Bottom line: If you decide to create a profile, make sure you include only minimal information, use strict privacy settings, and avoid any photos that are potentially embarrassing. Cope with feelings — jealousy, anger, sadness — from viewing friends’ Facebook pages. You’re not alone. The highly curated photos and posts from friends whose lives seem more fulfilling have been shown to make people feel sad, jealous, and angry. It may help if you connect with others who really “get” you. Create separate groups for your online pals: Put your close friends — the ones who post their joys as well as their trials — in one group. Add the ones who tend to present a perfect image to a different group, and only look at them when you’re feeling up to it. You also can connect with the growing anti-perfection movement. Real Simple‘s public Instagram profile, #womenirl, shares photos from people’s real (messy) lives. The bottom line is that the impact of social media isn’t fully understood, and it can trigger all sorts of responses. New parents are emotionally vulnerable because they’re tired, unsure, and perhaps suffering from postpartum depression. If you feel crappy more than you feel good, and sharing photos from your life doesn’t make you feel better, talk to a professional about what you’re going through. Find real, meaningful online support. There are some really supportive online groups with active, engaged members. We hope that Baby Chick serves as an educational resource for you! Local Facebook groups can also offer amazing support and area-specific resources. Hey, dads need support, too! With the rising number of stay-at-home dads, online resources geared toward fathers have ballooned. The National At-Home Dad Network and New Dads Survival Guide both have supportive communities for new fathers. 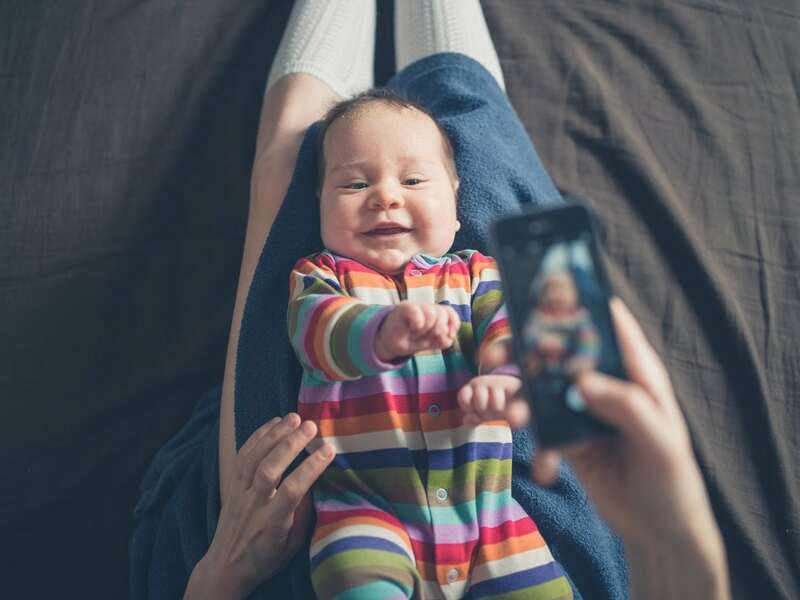 By the time your baby is 3, you will have recorded approximately 1 billion hours of video, taken 300,000 photos, and thought of 1,000 things you wish you could say to her when she grows up. Fortunately, there are easy ways to collect all these memories into one, easily accessible location. Go low(ish) tech. A lot of parents like to grab the opportunity to create an email account under baby’s name. Once she has an email address, you can use it to send her messages, photos, and videos so they are all collected in one place and she can read them when she gets older — and take ownership of her email address. Consider an electronic scrapbook or journal. Scrapbooking sites and apps let you create digital diaries of baby’s life. Some families like this option because older kids can use the sites and apps, too. There’s a wide range of programs you can use. Sign up for a private social network. Apps such as Notabli, 23snaps, and eFamily offer a secure way to collect and share photos, videos, and stories and invite a small number of people who can view them.